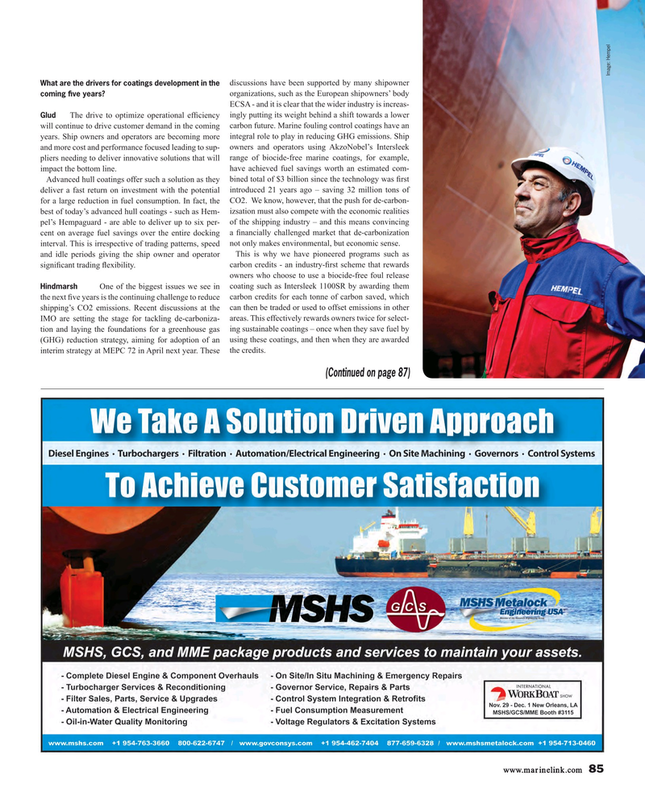 What are the drivers for coatings development in the organizations, such as the European shipowners’ body coming ? ve years? Advanced hull coatings offer such a solution as they bined total of $3 billion since the technology was ? rst deliver a fast return on investment with the potential introduced 21 years ago – saving 32 million tons of for a large reduction in fuel consumption. In fact, the CO2. We know, however, that the push for de-carbon- best of today’s advanced hull coatings - such as Hem- izsation must also compete with the economic realities pel’s Hempaguard - are able to deliver up to six per- of the shipping industry – and this means convincing cent on average fuel savings over the entire docking a ? nancially challenged market that de-carbonization interval. This is irrespective of trading patterns, speed not only makes environmental, but economic sense. IMO are setting the stage for tackling de-carboniza- areas. This effectively rewards owners twice for select- tion and laying the foundations for a greenhouse gas ing sustainable coatings – once when they save fuel by (GHG) reduction strategy, aiming for adoption of an using these coatings, and then when they are awarded interim strategy at MEPC 72 in April next year. These the credits.